The Rare Books and Special Collections (RBSC) is one of a kind library where books aren’t taken out, but instead are there to look and touch only. Located on level one of the Irving K. Barber Learning Centre, entering the library is an experience itself. You walk into a vault-like room with lockers for your belongings and you’re only allowed to take in a few items. Pens are forbidden — however, pencil and paper are provided at the front desk. It all makes sense since this is the home to a collection of valuable and unique books and videos, pamphlets and posters, photographs and archival research, historic maps and charts. 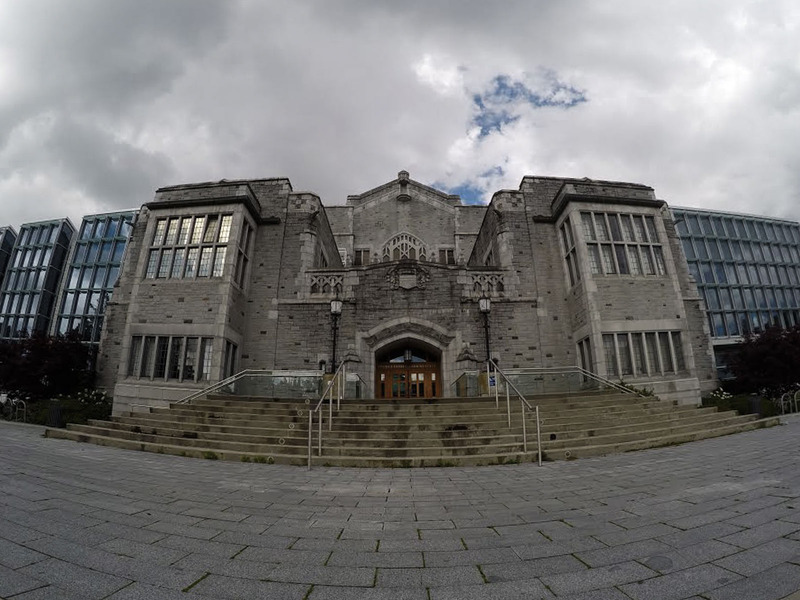 Collections here include Canadian literature, documents on the Chinese experience in British Columbia, and the evolution of the English dictionary — which are all available to you as a UBC student. Amongst all the histories and archives include timeless literary works such as these ones. With the delicate penmanship of Hugh Thomson’s illustrations, the romantic story of the Bennet sisters and the men so keen on taking a wife is bound in forest green with page edges bordered with gold. 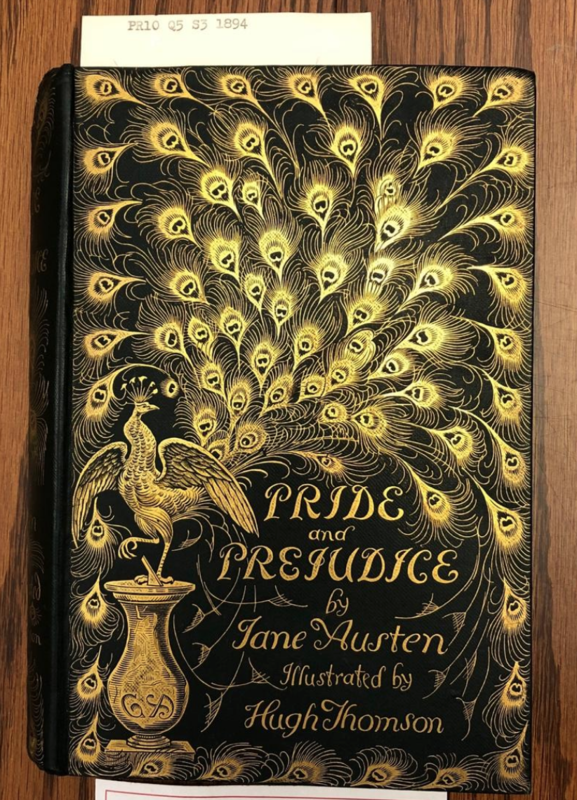 This copy of Pride and Prejudice (1894) has the beautifully illustrated golden peacock designed by Thomson who was a well-known artist for his pen and ink style during the Victorian era. He had worked on a few of Austen’s novels, including Persuasion (1898) and Sense and Sensibility (1896) to name a couple. The library holds the first edition, but unfortunately, this copy was not it. They also have the first edition of Emma. Peter Pan, the boy who wouldn’t grow up, and Wendy Darling, who chooses to grow up, is an adventurous play by J.M. Barrie that is loved all around the world. 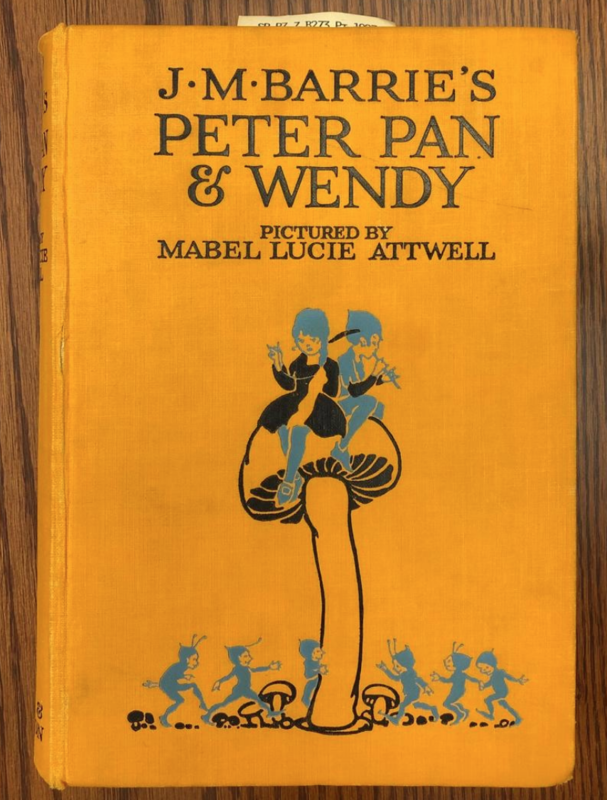 It was published in 1923, filled with Mabel Lucie Attwell’s colour plates as well as black and white illustrations. This hard cover has black and light-greyish blue detailing on an orange pictorial cloth cover that has still kept its vibrant hue. The drawings are still colourful and with it the texts which makes it impossible to put the book down. 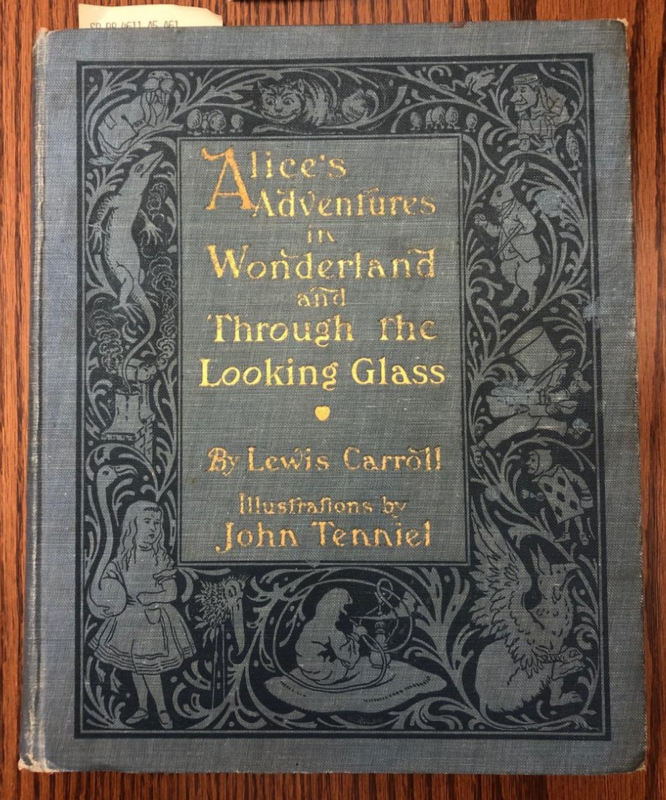 This is the full version of both stories — Alice’s Adventures in Wonderland and the sequel Alice through the Looking-Glass — Lewis Carroll’s creative storytelling and Sir John Tenniel’s delicate details fully suspend disbelief as readers follow Alice “down the rabbit hole” into Wonderland. The pages are thoughtfully stamped with prints that depict the scenes drawn by Sir John Tenniel, a Victorian illustrator who was personally approached by Lewis Carroll to do the works. Both imaginations are beautifully protected in a greyish-blue cloth with the title lettered in gold as the characters border around it.